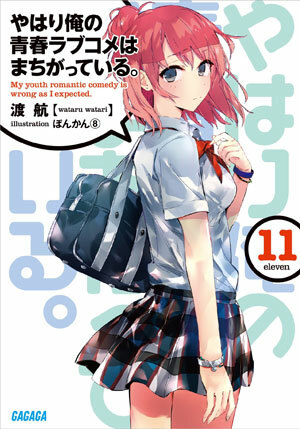 Yahari Ore no Seishun Rabukome wa Machigatte Iru is a romantic comedy which revolves around antisocial high school student, Hachiman Hikigaya, who has no friends, no girlfriend, and a severely distorted view on life. When he sees his classmates talking excitedly about living their adolescent lives, he mutters, “They’re a bunch of liars.” When he is asked about his future dreams, he responds, “Not working.” In an attempt to fix Hachiman’s twisted personality, his teacher forces him to join the volunteer ‘service club’, where the only other member happens to be one of the school’s most beautiful and smartest girls, Yukino Yukinoshita. 5/5 best slice-of-life I’ve read so far. MC is very relatable in a way. Read all of the volumes as well as both anime seasons 5/5. Volumes were better though, details were skipped in anime. TL;DR: There's a reason why this novel got ranked first 3 TIMES IN A ROW (2014, 2015, and 2016) on kono light novel ga sugoi (This Light Novel is Amazing! annual magazine ranking). Characters- the characters, even all the potential harem candidates that are usually 2d cutouts in other novels, actually have personalities. The MC has a... "unique" view on the world, which always adds comedy to keep the story fresh. The other girls are all different - one is cool, one is trying to fit in, one is a... more>> liar, etc... in other words, each character is different unlike most other novels, where all the side characters serve the purpose of glorifying the MC. Every character has his/her own flaws (especially the MC), and the whole cast struggles through common (or maybe not so common for unsocial people like me) high school dilemmas together. Each character is involved in the plot, and none are forgotten. The only flaw I see is the lack of development in the best girl route (sensei). Considering that, 9/10. This is the best slice of life story I have ever read. The writer views and contempt of society is well interpreted the characters are amazing, even side characters are worth mentioning and protagonist view of society and his occasional comments are worth to listen. The story is only lacking on the romantic aspect, all the other elements are in it but only romance is missing but it will come in the next novel probably. Everybody should read this novel as it has its values like they will be open to... more>> themselves as it shows that trying to be someone else other than themselves is only going to hurt yourselves so live the way you want. This a damn good LN to read due to how real the relationships feel and form. Also, I have never read anything that captures a cynical loner's thought process better than this novel. That sounds bad buts It's really nice to read how the MC meets with and interacts with these people and slowly builds a relationship with them. He changes them through the interactions and they change him in ways I won't spoil. Each novel will deal with a single problem, “request” rather, and along with that the characters deal with each... more>> other and develop along the way. I, myself, don’t like a few characters but it isn’t for their lack of detail or depth; it is simply my own personality and opinions not finding them enjoyable. I am sure that if you read it you might find a character that you don’t like, but even if that happened you would probably still enjoy the series like I did. The main character, Hikigaya Hachiman, is about as cynical as it can get. He thinks poorly of life in general and because of this, his narrative is quite funny and enjoyable. It is a first person narrative so you are getting his thoughts on everything. A typically simple dialogue might end up being really long because of his intermitting thoughts. Because of that I would recommend giving one novel a shot to see what it’s like. If you like it then you will like the rest; if you don’t like it then just give up because it is more of the same and the only thing that changes is that the story picks up in the second half and the author gets better at writing. His character is most certainly developed but it will still be more of the same so it’s quite critical that you like the him. Love the story, has it's interesting side because of the MC character, which you can usually refer to and understand him in a somewhat extent, and his methods, found it an awesome ROM com though it might come down to a harem or absolute FA mode in the end. Easily the best slice of life light novel you will ever read. A great cast and great character interactions is what this novel depends upon. If you like slice of life then read it. Why is this tagged seinen though ?